If you haven’t watched Sam‘s videos yet, you’re missing out. I appreciate how honest she is. If she likes a book, she will praise it to the heavens and back. If she dislikes a book, well… you’ll know it too. One of the book series she’s been loving is the Grisha trilogy. She brings the books up every now and then and every time I put them on my mental tbr. Last week, she was praising them again and I couldn’t put it off any longer, I just had to read them. 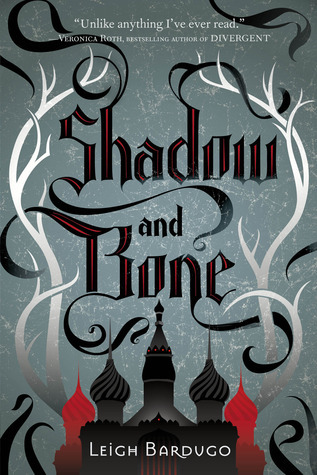 So I picked up the first book in the trilogy: Shadow and Bone. This book is super fast-paced, it took me a bit by surprise. A good surprise! This was exactly the kind of read I needed. There’s a lot of action and I just wanted to keep reading and reading. At one point, I had to force myself to put the book down and go to sleep or I would have been a zombie at work the next day. I liked pretty much everything about this book. The characters are interesting, the story-line twists and turns, the magic is well-explained and all of this means that you can imagine yourself in this world. Let’s focus on the main-character. Alina Starkov is both strong and weak which is precisely what I like about her. She’s strong in her will and character (and power) but she’s also weak in her longing to fit in and her trust in the wrong people (and because of that power…). I like how she’s never the hero. At least not really.. not yet. Maybe that will change in the next two books. We’ll have to wait and see. I was a little disappointed in the ending. It all happened a bit fast and could have done with a slightly slower pace and more details but hey, I’m not complaining. The majority of this book is really, really good. I have moved on to book two and it’s taking some effort to get back in that “can’t stop reading” mood. I guess when the pace will pick up again, it’ll be harder to put it down but for now I’m slowly making my way through. I’m reading about five books right now 😉 so not sure when I’ll actually finish it.